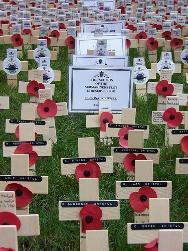 Today is Remembrance Sunday which actually falls on 11th November - Armistice Day. The Queen and other Royals attended the Festival of Remembrance at the Royal Albert Hall last night. The Ceremony of Remembrance and Cenotaph Parade take place on Whitehall from 10.30am with Two Minute Silence at 11:00am. There was some pomp, circumstance and kids with strawberries on their heads at the Lord Mayor's Show yesterday. The Met have arrested some of its own officers over dodgy expense claims. Now Amy Winehouse's husband is in trouble. Pete Doherty turned out to watch (grateful it's not him this time). Illegal immigrants discovered working in every single industry. Even immigration. Pudsey fever sweeps the nation. The Spice Girls are everywhere yet the only thing that anyone can remember about their "single" are the innappropriate scanty shots of Posh and Geri's malnourished, over-toned abs in the video. Image courtesy of Andy Wilkes via the Londonist flickr group.